As I have mentioned before, every since I chopped my hair off I have had to put so much more effort into maintaining my hair. 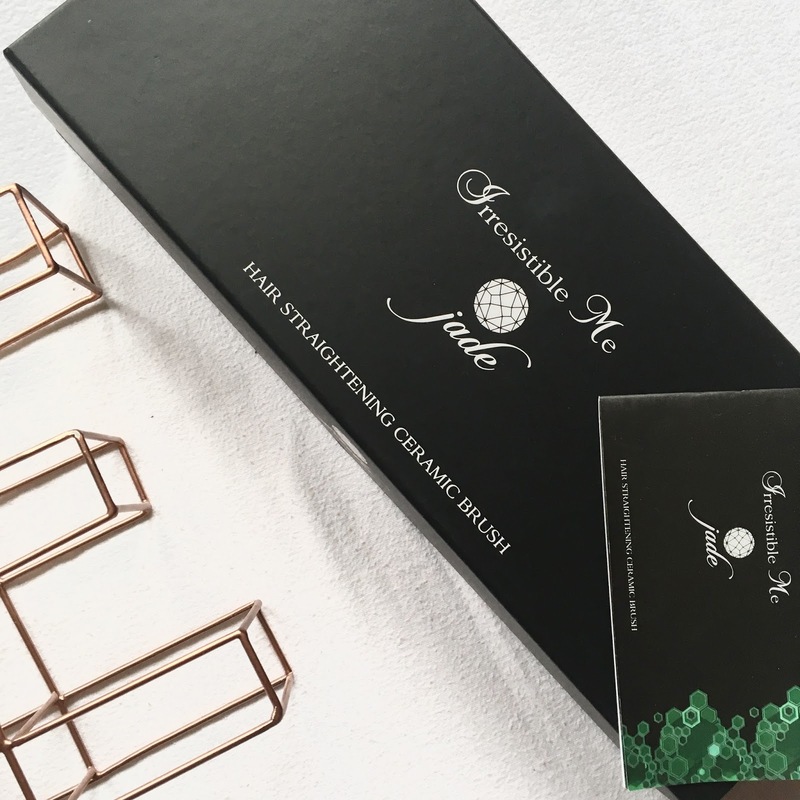 I have been loving straitening my hair so when the Irresistible Me contacted me to review their Jade Brush, a ceramic straightening brush, I jumped at the chance. I have actually seen these before and have been eying these up so I was super excited to give it a go. First of all, the mint green colour of the brush of gorgeous, that is one of my favourite colours so having this on my dresser or in my room is going to be the best. Not to mention how glamourous the packaging looks, I might have to keep it in the box just to show it off. In terms of the product, as you can see it looks like a normal brush but with a twist! It didn't take long to heat up at all which is a bonus, I mean who had time to wait?? I cranked it up quite high as my hair doesn't straighten well but you can change from 270º(130ºC) to 450ºF(230ºC) 270º(130ºC) depending on how hot you want it to be. It was hot enough to straighten my hair, however, what I love it never burnt my scalp or hands, which is such a result!! 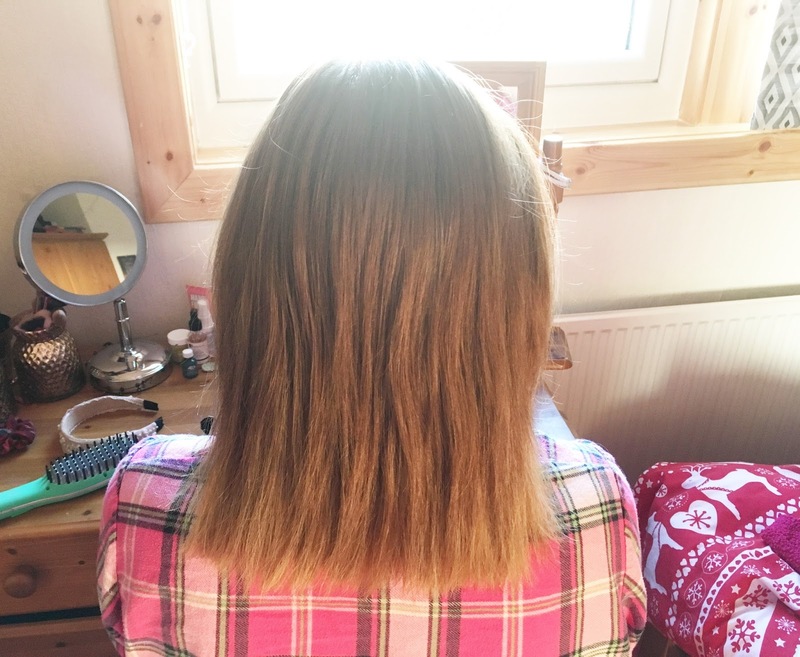 I sectioned my hair my hair into three(top/front, middle/back and bottom) and easily straighten each section, there was no fiddling with a brush and straighteners as this an all in one!! 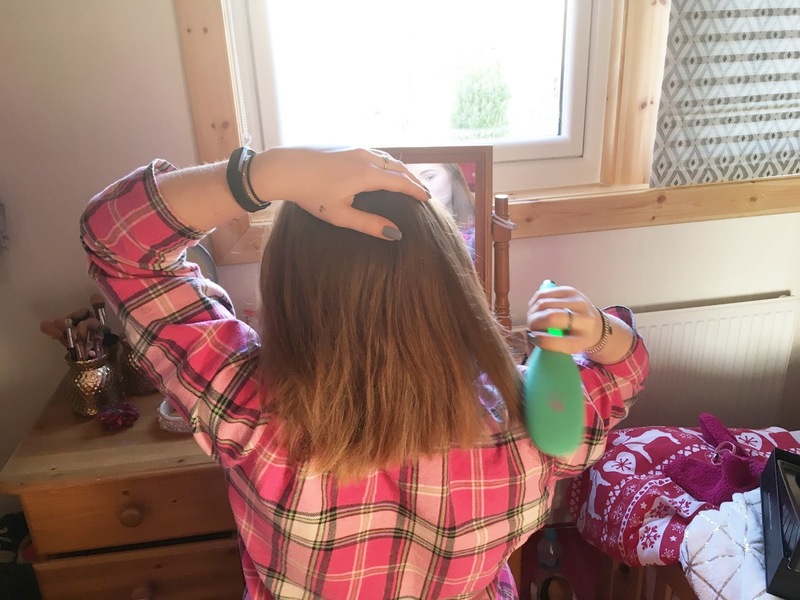 My only downside is as much as it was super easy to use I felt I had to straighten my hair a few times before it was actually perfect, however, like I said I do have major issues with my hair and its flicky-ness (yes that's a word ;)) so I wasn't fussed. Also if you purchase outside America you will need to buy an adaptor, I had already bought one, I think I got mine for £3 in Argos, so they are super cheap! Overall, I absolutely love this product, can't wait to use it in my daily hair routine. The Jade Brush is available on Irresistible Me if you want to have a look. They also have gorgeous headbands, like the one is my picture! Let me know if you have ever tried this brush?? What are your thoughts?? I've been eyeing these up for ages after simply getting too lazy to do anything with my hair! The colour of this one of gorgeous and definitely tempts me that little bit more! Great review! I've seen these around and have been so intrigued by them! The colour is so pretty too! Oh wow! This brush looks amazing actually and sounds fab too! I've never heard of it before but I'm glad I have now. I think I'll look into getting one tbh. The colour of this is beautiful! I used the Simply straight brush from JML and found it didn't quite get out all the kinks. I think these brushes work much better on people with thinner, more fragile hair as they aren't as harsh as straighteners. Awh I've seen these but always wondered whether they actually worked! Great post. This is a really cool product! I'm always after new ways to style my hair so I may have to look into this. Thank you for sharing, Emma! I've got some headbands from irresistible me and they're so pretty! 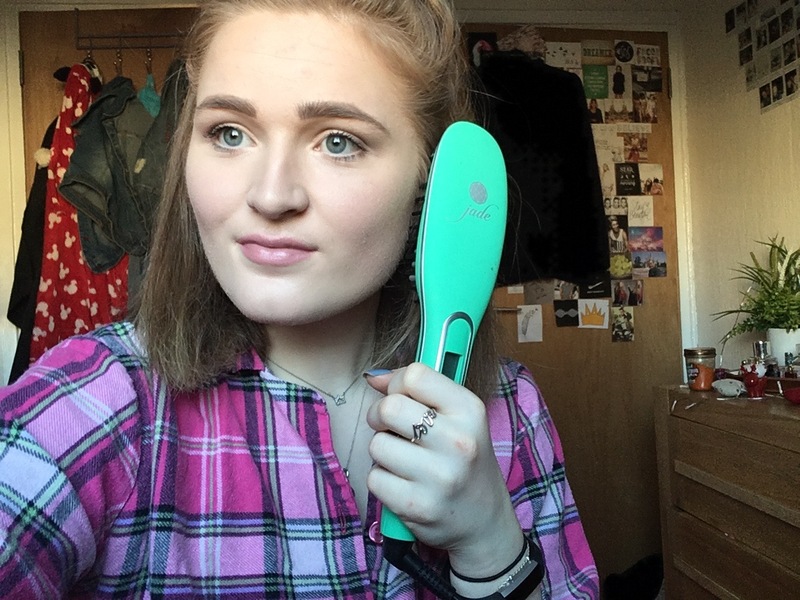 I have tried a straightening brush before and I barely use my straighteners now I've got one! 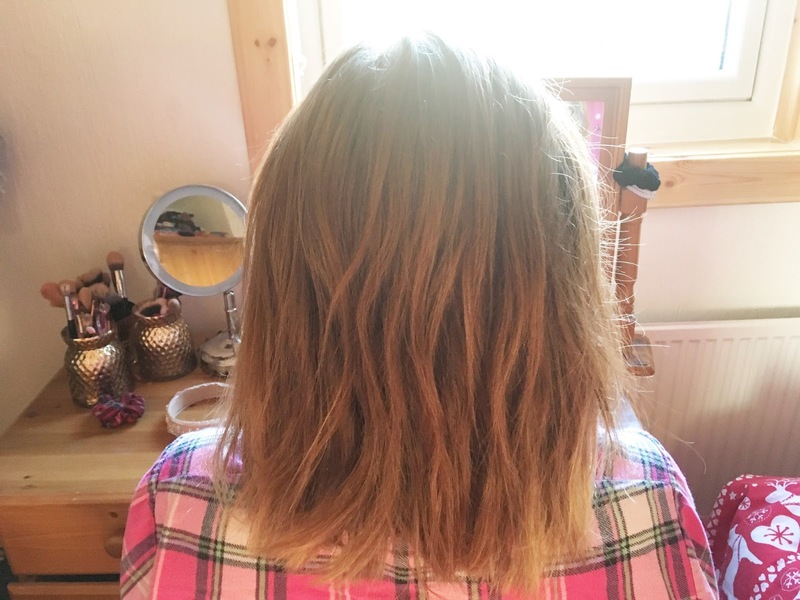 I've been seeing loads of straightening brushes around and wondered if they worked but it looks like you got fab results! I think for someone like me with very long hair, it would be quite tedious to continually brush but for someone with shorter hair, this is so convenient. Wow this looks like a really amazing product for your hair! I'm lucky that I have naturally straight hair but I can imagine it's a pain having to straighten hair every day! It's great that you don't have to fiddle around with straighteners and a brush when you can use this product instead! I have been seeing these a lot recently, really want to give it a go but I am so attached to my GHDs that are like a million years old! !